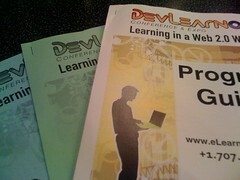 I had a great time at DevLearn 2008 and the Adobe Learning Summit last week. Here is my New Media presentation from the conference. I also gave a all-day Podcasting Workshop the day before the conference. Here are the slides from that presentation in PDF format. This entry was posted in New Media, Social Media, Speaking. Bookmark the permalink.